If you are a professional photographer, then most likely you are dealing with professional models and stylists. So, you don’t have to think of the models’ hairstyle and makeup. But if you are an amateur photographer, then you certainly have a lot of friends’ portraits that leave much to be desired. Lool at the results you can easily get with the program. You can make your friends look perfect in the pictures by using special photo makeup software. SoftOrbits is happy to present SoftSkin Photo Makeup. With this tool, you can improve skin imperfections and defects, remove red eye effect, apply virtual makeup and much more! 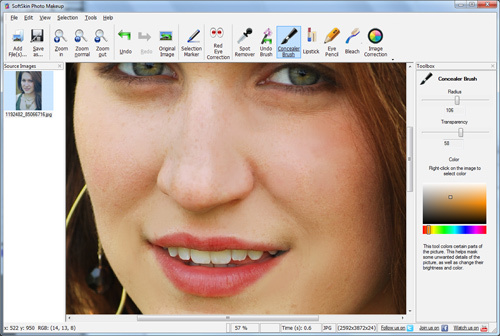 First, download and install our photo makeup software. The built-in setup wizard will guide you through this process. Then add files you want to convert using the “Add file(s)” button. Then take a look at the toolbox. You can use any of the marker tool, spot remover, red eye correction, undo brush, concealer brush, lipstick, eye pencil, bleach and image correction tools. Marker and spot remover are perfect for skin improvements. Concealer, lipstick and eye pencil can be used to apply virtual makeup. Bleach tool allows you to whiten teeth and eyeballs. Red eye correction tool removes red eye effect. 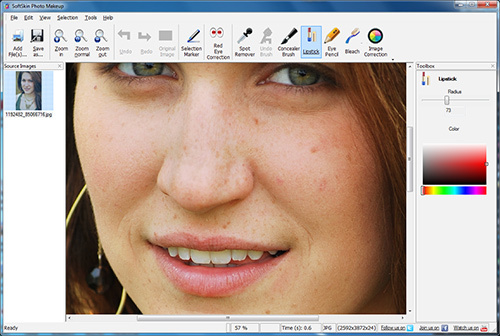 Image correction automatically improves image colors.